Gently sloped furrows allow water to better soak into the soil than steep furrows. The water that leaves the field flows more slowly, leaving the soil in place. Benefits of row arrangement include: more uniform irrigation, fertigation and drip fumigation; less ponding of water in furrows; ease of harvest; professional-looking fields; and reduced erosion control and clean-up expenses. Row arrangement is a technique that requires practice and experience to master, and for some parcels it can be difficult to achieve low slope furrows throughout the block. Other considerations are soil type and existing hard pans that may create sloughing of the beds. The goal in row arrangement is to make the furrows as close to level as possible without causing water to pond in the furrow. A good target to shoot for is 1.5% to 2% sloped rows, but slopes closer to .15% can be more desirable without causing ponding. Avoid creating row slopes steeper than 4% or 5%. 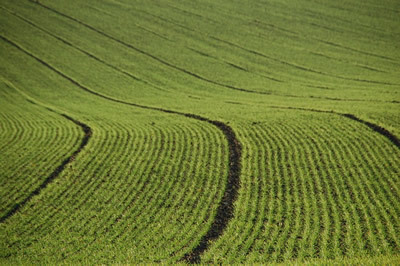 Flat furrows are not a problem unless water collects in them which can damage beds or crops. Modify these methods as needed to best fit the land you farm and your own methods of listing beds.